If you're someone who doesn't think of dogs as being at least partly human, and if that sort of thing makes you roll your eyes, you might want to skip this post. 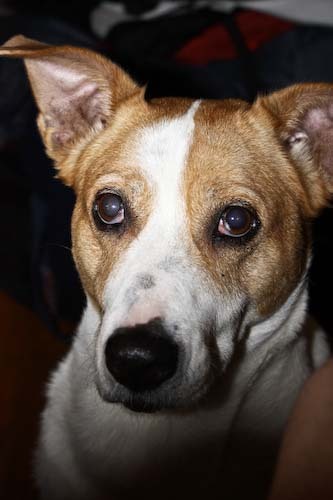 If, like me, you're convinced that your dog understands you better than (almost!) anyone else, maybe it's time to show your best friend a little culinary love. This is Pancha, my little rescue dog (though not so little, she's about 50 lbs.). I adopted Pancha five years ago from a shelter when she was three. She's named after a mountain pass in Colorado, because we're both Colorado girls. Pancha and I began our relationship during my senior year of college, and since then she's moved with me from Colorado Springs (where I went to school), to Denver and finally to New York City. And let me tell you, she is the best friend a girl could ask for. Recently Pancha has been having some health issues in her middle age. She had surgery in mid-October, which is her adoption month. (I say month because I don't remember the exact date of her adoption, although I could probably figure it out. But this way gives me a bit more flexibility!) Normally I do something extra special nice for her during her adoption month, but decided to postpone the treat-giving until she was feeling more like herself. Well, I'm happy to report that she has recovered famously, and after an hour run yesterday I can say that her little "tune up" was a success. This recipe comes from the Three Dog Bakery Cookbook and I have to admit it's pretty much the most basic recipe in the book. But Pancha is a peanut butter fanatic (an easy thing to say given that she, like me, will try absolutely anything that is put in front of her!). 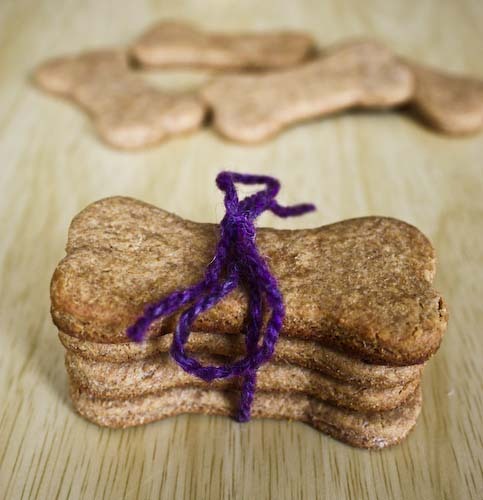 The recipe is supposed to yield 30 large bones, but since I don't want Pancha to get so fat she can no longer run with me, I'm letting her give half of them away to some other dogs in the building. Isn't she generous?! Combine the flour and baking powder in one bowl, and the peanut butter and milk in another. Add the wet ingredients to the dry ingredients and mix them all together. Turn the dough out onto a lightly floured surface and need it together a bit until it is firm enough to roll out to a 1/4" thickness. Cut out your dog's favorite shapes. Places the treats on a greased baking sheet and bake for 20 minutes until they're golden brown. Cool, then share the love. Andrea, I have to ask...where in C. Springs did you go to school? I would just be too small a world if we actually went to the same college! Pancha says thanks to Ragnar and Micha! Micha, I went to Colorado College, graduated in '04. Did you too?! What a sweet dog, and those bones look tasty to me! Happy birthday, Pancha!! Glad you've recovered well from your surgery. 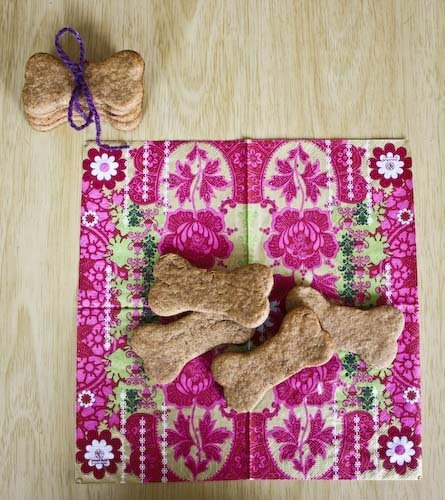 Thanks for sharing this recipe - can't wait to share it with my canine friends! 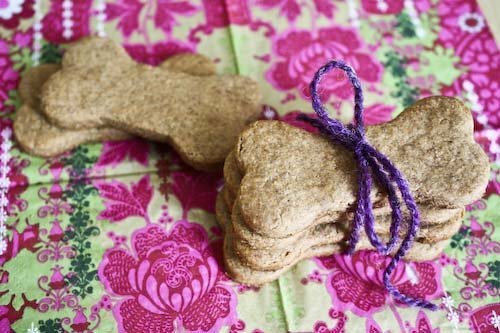 I love peanut butter dog treats, I made a whole batch a few months ago but I don't have a dog. I ate the entire batch myself, despite them being incredibly dry, and friends couldn't resist them either. Something about a simple wheat and peanut butter combo made them great to snack on. I've always thought I was a dog in a previous life. 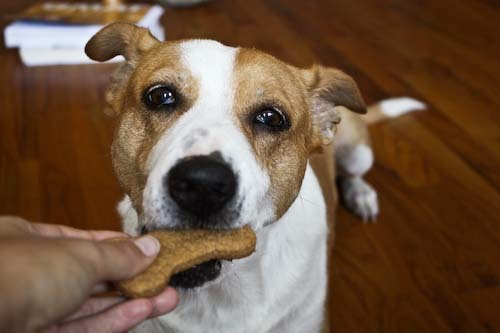 Of course, if you're going to eat dog biscuits yourself, you might as well make "Special" Peanut Butter Dog Biscuits =). Me too! I graduated in '01! I'm so proud of Colorado today! Denver Native and Regina, Pancha says thank you for the birthday wishes! Lisa, Pancha thought they were pretty good! 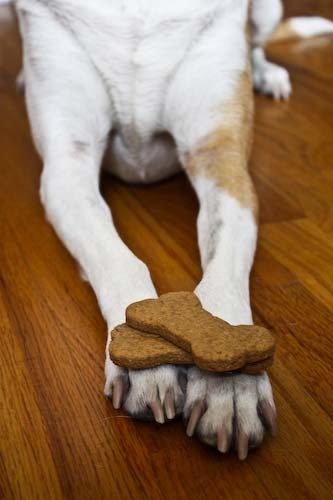 Peanutbutter boy, I love those dog poop cookies! Hilarious! Micha, that's such a great coincidence! I also couldn't be prouder of my home state today! Thanks for posting the recipe! How long will these last in an airtight container on the shelf? Hi Kristina, the book said they'll keep about 2 weeks in an airtight container. However, if you're a sucker for puppy dog eyes like I am, they probably won't last that long! She is certainly gorgeous, Andrea! And I'm glad she is feeling better now. awesome. neither of out dogs would dare sit still long enough to take a picture. what a good girl pancha!